SAN BERNARDINO, California — Beatriz Valenzuela arrived at her job on Dec. 5 at 5 a.m. just like any typical morning at the San Bernardino Sun: She updated the So-Cal traffic report and Tweeted it out, and then began her day’s work as a reporter. At 11 a.m., she heard someone announce over the police radio that shots had been fired at the Inland Regional Center on South Waterman Avenue. She didn’t pay much attention, because for all she knew it could have just a car backfiring. Valenzuela continued her work. She had no idea that she was about to be plunged into the second most fatal California shooting that would be investigated as an act of terrorism. It wasn’t until the second police bulletin came in that she knew she was going to be involved in something big. The second she heard the words “active shooter,” she ran to the scene. After doing this for nearly a decade, Valenzuela thought this was just going to be a usual day on the crime beat. Doug Saunders is also with the Sun. He was the first reporter to get to the Inland Regional Center, just minutes after the shooting, which killed 14 people at an office holiday party. He was early enough to make it through before police secured the perimeter. He grabbed his camera and began taking pictures and reporting what he saw to his co-workers back at the newsroom. “You are there to not only tell a story, but to record history,” he said. “It is about documentation and getting it right. That is a normal reaction when journalists hear about a crisis, says Matthew LaPlante who teaches global crisis reporting at Utah State University. It is an “extra emotion” that tells reporters they have to go to work, he says. Once she got there, Valenzuela began to investigate the crime scene and to piece the story together. Her police radio continued to blare reports of different numbers of deaths and injuries, but none of the information was confirmed. She prides herself on accuracy. LaPlante said reporters during a crisis learn the facts faster than almost anybody else, so they get to figure out what had happened. People don’t understand how quickly information changes and develops, he said. On top of that, they are trying to make the information make sense to other people. That’s where a lot of journalists go wrong, says LaPlante, who was a police reporter at the Salt Lake Tribune and also reported from Iraq before joining the USU journalism faculty. They are trying to do something that is impossible, he said — make sense of something that doesn’t make sense. “Mass shootings don’t make sense,” he said. Family members of victims and the public demand that you do your job at a time when it is impossible to do your job correctly, LaPlante said, and sometimes you screw up. When the public is demanding facts, that is all you really have time to report, he said. There’s not a lot of time for storytelling, he said, so human compassion tends to get left out of initial reports. 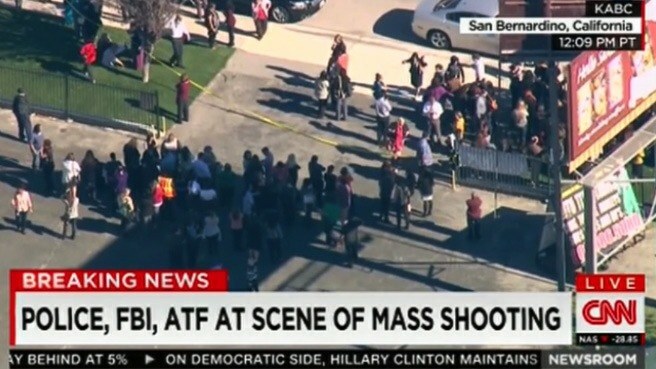 As more and more news outlets ran updates on the San Bernardino shooting, the story became contorted, in part because there was a lot of information that reporters, the public and the police just don’t know the answers to, said Valenzuela. 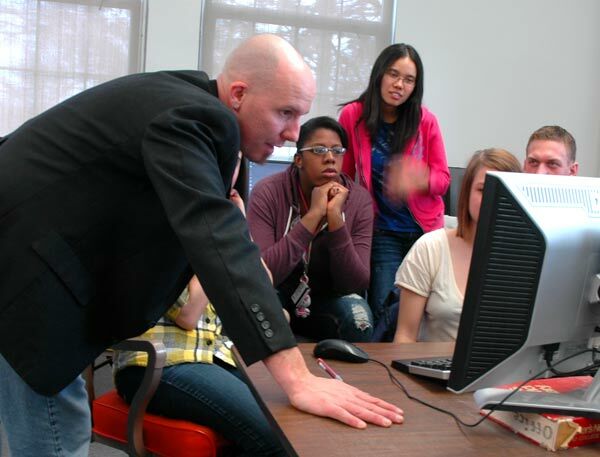 Journalism Professor Matthew LaPlante working with students on crisis reporting exercise. LaPlante says this is common with breaking news stories. The national dialogue happens so fast and develops so rapidly, thanks to social media. “Social media is like regular media, but on steroids and speed,” he said. The dialogue can go in one direction that it sometimes doesn’t return from, he said. That is problematic, because it encourages people with simple answers — like politicians — to stand up and it allows us to dismiss the traditional media, he said. The public is not usually content with the complexity of the answers. They want to be told how to think about things. It is why they follow politicians promise simple solutions. Humans want to be able to see things in black and white, LaPlante said. But a journalist will try to tell the complex backstory, he said. It is estimated one in four war correspondents has post-traumatic stress, according to Frank Ochberg, a psychiatrist who studies trauma. He has dedicated years of research to studying PTSD, though he now refers to it as post-traumatic stress injury (PTSI), rather than calling it a disorder. “The journalists are exposed every bit as much as police and first responders are to traumatic events,” he said. Many reporters who grapple with PTSI take a lot of pride in doing hard news and they are good at it, he said. But Ochberg says PTSI can affect your love for your work, your pride in yourself, and your confidence. In the old days, people would alleviate the pain with drugs and alcohol, he says, but journalists shouldn’t self-medicate and need to take good care of their health, and need to have a break every once in awhile. “I have more respect for the journalist who admits that they are suffering than for the one who won’t admit it to themselves and to certain people who care about them,” Ochberg said. While she says she doesn’t suffer from PTSI, Valenzuela said she was stuck in reporter mode until six days later after the shooting, aside from the three-hour break she got for her daughter’s 11th birthday. “I joke that I am broken and I have a prune pit where my heart should be,” she said. Regardless of her prune pit for a heart, Valenzuela says she finds meaning in her day-to-day crime coverage.